This step of the wizard is available only if you have chosen to configure virtual infrastructure server connection settings at the Virtual Infrastructure Type step of the wizard. In the Server field, specify FQDN or IP address of the virtual infrastructure server you want to connect. In the User name and Password fields, specify credentials of the account for connecting to the server. In the Port field, change the port number if required. 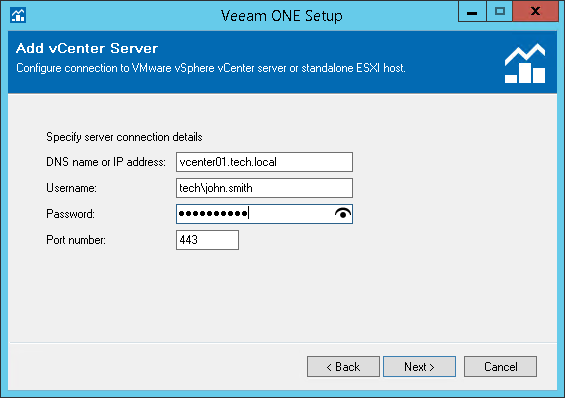 The specified connection settings will be propagated to all Veeam ONE components so that they can automatically connect and retrieve data from the virtual infrastructure server. For details, see Default Configuration.